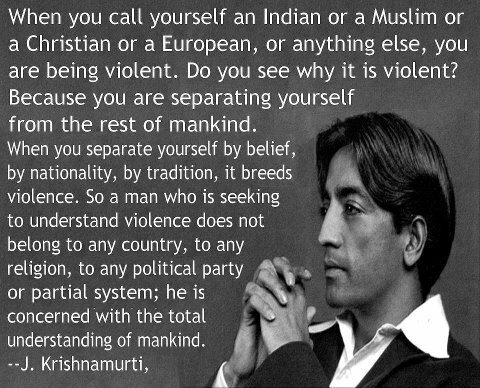 Recently, a quote by Jiddu Krishnamurti (an Indian author) was shared with me touting that by identifying ourselves differently from any others, we are in fact committing violence (See the picture below this paragraph). This excellent example of cultural relativism, although quite extreme, is a great starting point to jump into a topic that I think is one of the most important of our time. Keep in mind that the scope of this topic is so large that it will certainly take more than one post and one opinion to do it justice. Cultural relativism, to provide a basic understanding, is the concept that no culture is objectively right or wrong, and is commonly associated with the multiculturalist worldview. Relativists believe that every custom, tradition and culture is worthy of equal respect, regardless of what it actually entails. It’s the concept that preaches that it’s ok for a Sikh child to bring his Kirpan (ceremonial dagger) to school, and that it’s wrong of us to expect a Muslim woman to unveil at the airport for security checks. Many people will argue with this very simple and anecdotal definition I’m sure. However, I think it gives any reader the means to understand that despite the warm fluffy feeling you get from being a ‘multiculturalist,’ there are in fact some reasonable arguments against it, or at least that it has been taken to too far an extreme. Some may argue that I have defined ‘moral relativism’ and that there are significant differences between the two. However, I think most of us have some sense of the basic underlying concept, if only from our experience with multiculturalism. This post is not to debate the specific terms or definitions, but to debate the concept in its entirety. I will also not be tackling the legitimacy of multiculturalism as a whole in this post, although it is safe to assume that I disagree with much of what is has become. All I’d like to do for today is discuss the intellectual quagmire that cultural relativism forces reasonable and thoughtful people into. Equality under the law is a right that all people deserve. That being said, I don’t think for one minute that anyone believes equality means we are all the same. In fact, it’s my opinion that no one is the same, and biology (for as little of an expert as I am in the field) seems to corroborate that theory. Where uniqueness exists, differentiation and separation follow. Here is where we meet the intellectual quagmire I speak of. If separation, or differentiation, is innately bad (or ‘violent’ as quoted above) then we are imposing an intellectual constraint on our thinking. By ignoring these differences, or even further, by regarding any acceptance or discussion of them as wrong, how can we ever understand them? We can’t, and this is true whether we are discussing ourselves individually or the various cultural, national, religious or ideological groups we belong to. With this constraint in place, we actually become less able to analyze the differences that certainly exist and (for better or worse) are quite important. In addition, if our conclusion is a pre-determined equality, what value is there in learning about these differences? Yes it’s a choice, but all options result in the same. It would seem to follow quite easily that with this approach we absolve ourselves of any requirement to learn about them, or compare them to our own. In fact, doing so would be considered ‘violent.’ The result is that we understand ourselves, and each other much less than under normal circumstances. And so, critically analyzing these differences is devalued in favor of a warm gooey feeling that every custom is worthy of equal respect just because someone believes in it. I would argue a different approach. If instead, we consider the virtues and drawbacks of various aspects of different cultures, we are not only forced to learn about them, but we inevitably learn from them as well. This is one of the core aspects of the Westernist creed, a very important ‘separation’ of people, as I have argued in the past. We should take advantage of our wonderful opportunity to know so much about people from so very far away. We can do this by the type of reasoned consideration I suggest above, with the result of bettering our own culture as we include aspects of others that we find merit in. All the faults of the former British Empire aside, their exposure to and critical analysis of so many different peoples of different cultures allowed them insight that eludes the modern cultural relativist. 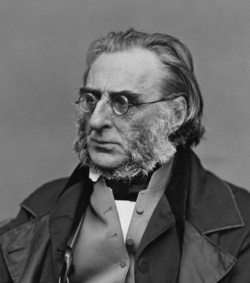 A great example of this would be General Sir Charles Napier, Commander-in-Chief of the British Army in India and his harsh feelings with regards to a wonderful (note heavy sarcasm) Indian tradition called ‘Sati’ or ‘Suttee.’ Sati is a custom where recently widowed women were immolated (burned to death) on her husbands’ funeral pyre. Aside from the obvious foundation of gender-inequality engrained into the practice, I would hope all multiculturalists would accept the pure barbarity of this kind of ‘cultural’ tradition. Napier’s thoughts were as follows “You say that it is your custom to burn widows. Very well. We also have a custom: When men burn a woman alive, we tie a rope around their necks and we hang them. Build your funeral pyre; beside it, my carpenters will build a gallows. You may follow your custom. And then we will follow ours.” Harsh indeed, but it is also quite striking how this situation outlines many of the perils of cultural relativism we face today. I would hope that even in today’s relativist quagmire we would still have the courage to react to Sati with a similar outrage, but sometimes I wonder. The gallows may not be our best option, but I don’t think respecting that particular custom is either. And I imagine there are a good many South Asian widows who would agree (especially the ones who were able to live out their natural lives thanks to the 1829 ban on the practice by the British). Napier lived in a time when western civilization had confidence in its own culture, perhaps a little overconfidence, but that’s something that we should learn to tame and at the same time, maintain. Instead, we have admonished that confidence in this quest for cultural relativism, something that can only result in a loss of many of the great strides we’ve made over the millennia. Freedom of expression, gender and minority equality, democratic institutions; all of these are fantastic aspects of Western culture, which I intend to praise over and above any culture that does not engage in them. That is something I will never apologize for, and something that I certainly don’t equate with violence. Some might bring up the negative aspects of western culture (which certainly exist), as proof that relativism is necessary, but in fact that only proves its folly. For if all cultural traditions and customs are equally valid, than all of our own negative ones would be granted the same protection. By casting away this mentality, we can search out and maintain only the good, while tossing out the bad, regardless of its origin. Debate and disagreement can certainly fuel violence, but if handled correctly can also reduce it. There is no better evidence than looking at the record of war between democratic nations (it doesn’t happen); nations built on the premise that disagreement is not only important, but also necessary. By maintaining these ideals we have fundamentally separated ourselves from ‘the rest of mankind’ as Mr. Krishamurti describes, regardless of peoples willingness to talk about it. I believe that the argument against cultural relativism in the west is rooted in that fact that to the relativist, where two cultures clash, the western culture must be the one to bend. There is no argument by relativists that Mecca be opened to non-Muslims. It is their culture, their place, they may set the rules. But in the airport it is my culture that veils are not to be worn. A grave offense! And children must not carry weapons in school! That is my culture. Why must Western culture always be the one to yield, where it clashes with another? The Enlightenment itself was a prcodut of the Reformation, and both byprcoduts Christianity. The post-modern era has though cut enlightenment values from its Christian roots. Chesterton puts it succinctly, When a religious scheme is shattered it is not merely the vices that are let loose. The vices are, indeed, let loose, and they wander and do damage. But the virtues are let loose also; and the virtues wander more wildly, and the virtues do more terrible damage. The modern world is full of the old Christian virtues gone mad. The virtues have gone mad because they have been isolated from each other and are wandering alone. Thus some scientists care for truth; and their truth is pitiless. Thus some humanitarians only care for pity; and their pity (I am sorry to say) is often untruthful. 378KGS, it is amazing how many Western pleope still don’t realize that a strong contingent of Muslims worldwide will NEVER accept the existence of a Jewish state. These foolish politicians who think they can negotiate peace are just victims of deception. I have seen leftist students outside businesses that sell Israeli products protesting about Palestine. Although I have never been to Israel, I have read that many Muslim Arabs are Israeli citizens (20% of total population) and live there peacefully. I suspect that the Muslims in Pakistan and other places are unaware of this significant peaceful minority. Why then the Palestinian problem? Obviously religious ideology is to blame. The stirrers of the Muslim world won’t allow peace. Western leaders must realize this fact. « Poverty and Lack of Education Cause Terrorism… Right?